Upper A Arm Brace Kit - Grip N Rip Racing LLC. New redesigned brace for 2015. This kit is designed strengthen the upper A Arm rear mounting point just like our original brace but is much easier to install. This new brace is compatible with the Skidoo QRS Tech Link and Racewerx clutch tower brace. As many of you know the A Arm mounting points can bend from impact before the A Arms bend causing expensive repair. The A Arm should bend before the chassis so you can change an A Arm instead of having to do a complete rebuild of the front end because of a bent mounting point. A common problem is when you hit something with the ski turned it pushes the bottom of the spindle back. The Lower A Arm is stronger than the Upper A Arm and because of this it will force the upper A Arm forward and bend its rear mount. 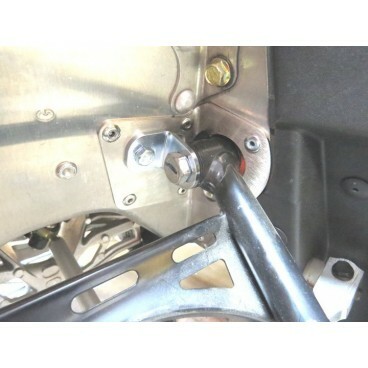 Some will not notice it right away but if you look at your shock and if its not in the center of the Upper A Arm or rubbing on the A Arm you most likely have a bent Upper A Arm rear mounting point. You can still ride like this if its not too bad but it will drastically change the caster angle of your spindle and will not handle well. This kit will fit on the Lynx. This kit will greatly strengthen this weak area. Kit comes with the left and right side braces. 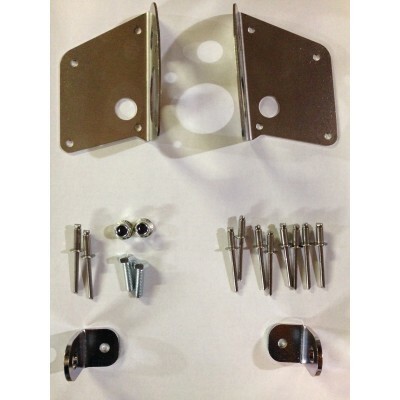 We recommend the new suspension module brace kit part 300-066 for maximum protection. Fits 2008-Current Skidoo XP,XM,XS,XRS, and T3 chassis. All models with 2 stroke and 4 stroke engines.Does NOT fit Skidoo's Race Sled. Works with Racewerx clutch tower and QRS Tech Link. Made out of stainless steel. Will not rust. Small angle pieces made out of steel and zinc plated.